Celery is part of the Apiaceae family of aromatic and hollow stemmed plants that also includes parsley, carrots, dill, cilantro, parsip and anise. In most recipes only the long, ribbed, crispy leaf stem (some of us call it a stalk!) of the celery is used. Celery seeds are often harvested and dried for use as a spice. There are a range of cultivars of celery being cultivated and growing wild, ranging in color from dark green to gold and red. Pascal is the type in production in the U.S. – it is a large, light green variety. Celery is high in dietary fiber and very low in calories, which made it famous early on as a diet food. It also has a stellar phytonutrient profile – full of antioxidants and anti-inflammatory properties. – Always wash your celery very well before using. A veggie brush comes in handy for this one. – Leaf stems should be seperated from the bunch, trim off the bottom edge and the leaves. Some folks use an paring knife to carefully peel off the outer layer where the long fibrous strings are – others just eat the whole darn thing. – Chop your celery right before adding to your dish or eating as it loses its phytonutrients quite quickly after being cut. – Leaf stems can be eaten raw, chopped into finger sized pieces and added to a raw veggie platter. Its aromatic, fresh crispiness combines nicely with a creamy dip. – Celery is often chopped and added to stir fry, stews and soups. – In Cajun cooking celery, onions and bell peppers are known as the Holy Trinity for a lot of saucy flavorful dishes. – Its leaves are strongly flavored and can be used in soups and stews. Leaves have a a high amount of vitamin C.
– Celery hearts refers to the innermost stalks of Pascal celery and are typically the most tender. – If celery gets wilty after cutting and you need to revive — sprinkle with water and let sit in the fridge for a while to recrisp. Look for celery crisp in appearance, relatively tight and compact, with no stalks that splay out. Look for the green, leaves should be free from yellow or brown patches. Store in refrigerator, unwashed, wrapped tightly in plastic bag for up to 5-7 days. Though celery looks like it will keep forever, it is losing its phytonutrients the longer it sits. Better to eat sooner than to save. Celery doesn’t freeze well. 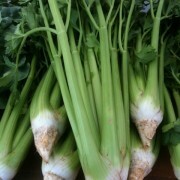 Early wisdom in European communities had celery growing as a vegetable for winter and early spring. It was thought of and used as a cleansing tonic to counter the salt-sickness of a winter diet.